My friend Sam photographed a double rainbow after a downpour. Amazing isn't it? I've never seen a double, much less one that you can spot the ends within a close distance. At this time (last Sat) it wasn't raining at my place so I missed it. 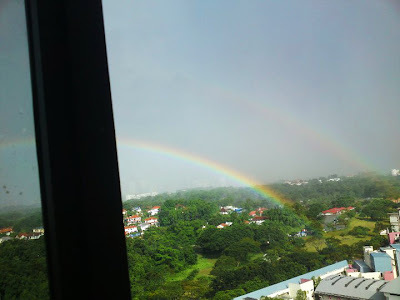 And from my 5th storey most rainbows are obscured by other buildings. This shot is from her kitchen on the 29th floor. I would say rainbows are an instant mood lifter. Ooh that looks fab, i have had many double rainbows and they go right over my house,wish i could find the pot o gold at the end LOL! Trish you are so fortunate to be able to spot them!